WWF’s mission is to stop the degradation of the planet's natural environment and to build a future in which humans live in harmony with nature. To achieve this mission, WWF seeks to involve and respect local communities’ cultural and economic needs in the planning and execution of its field programmes and conservation strategies. WWF has implemented a number of approaches that benefit local livelihoods through sustainable use of natural resources. These approaches include ecotourism, community fisheries, sustainable rattan harvest and production as well as sustainable collection of other non-timber forest products (NTFP) like resin or honey. Fish accounts for approximately 75% of Cambodia’s animal protein consumption and is especially important for the livelihoods of Cambodia’s rural poor. 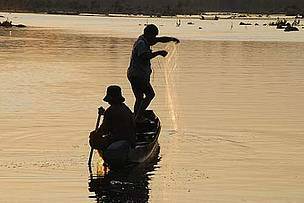 However, recent years have seen a decline in the productivity and diversity of Cambodian fisheries, probably due to fish harvests exceeding sustainable limits, widespread use of illegal and destructive fishing methods, and the destruction of floodplain habitat essential for fish reproduction. Community fishery establishment is a mechanism that can improve management of local fisheries and ensure local food security. In North-eastern Cambodia, WWF is working with Fisheries Administration and local government to assist local communities develop such community fisheries. This project aims to increase community understanding and recognition of the benefits and importance of sustainably managed fisheries through direct participation by local people in planning, managing, sustainably utilising and protecting fisheries resources. By assisting communities in the Srepok River area to establish community fisheries and develop and implement an effective community fishery management plans, the standard of living of local communities can be improved through sustainable fishery resource use and equitable benefit sharing. Rattans are climbing palms that are extensively used for making baskets and furniture. There are around 600 different species of rattan worldwide, many of which have restricted natural ranges. In Cambodia, 21 species have been identified so far. Rattan is an important commodity in international trade and generates a significant amount of foreign exchange. WWF’s rattan project works throughout the three Greater Mekong region countries of Lao PDR, Vietnam, and Cambodia to promote systems of sustainable rattan harvest and production. 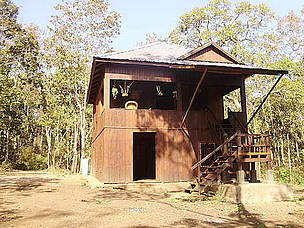 In Cambodia, the project has also initiated the foundation of the first Rattan Association of Cambodia. Recognizing the threats connected to over exploitation of rattan resources, WWF partnered with Cambodian and the Lao PDR government as well as the private sector to being a three phase project aimed at strengthening sustainable rattan harvest and production. Identification and EcologyIn its first phase (2006-2008), the project focused on the identification, growth, and ecology of key species, on the, the dynamics of the rattan market as well as on the development of a community-based sustainable harvest and production system. Previously, lack of botanical knowledge had constrained development of the rattan industry, especially in the selection of the right species for processing and trading. Within this context, the project also produced the first field guide to the rattans of Cambodia. In addition, the project set up community based model approach that promotes sustainable management and use of rattan resources, so that forest ecosystem where rattan are present are conserved. Continuous field research on growth and yield of specific rattan species. Development of rattan cleaner production techniques. Increase the knowledge on rattan industry, conservation, and ecology by implementing a forest biodiversity impact monitoring system in order to support development of the rattan industry. 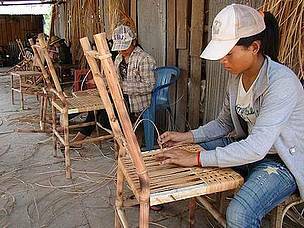 In the fall of 2009, the project successfully helped launch the first rattan association of Cambodia. This network of rattan suppliers, processors, and traders aims to increase understanding about the need to maintain a sustainable supply of rattan for clean and better production. It also provides new knowledge and experience related to rattan processing techniques, trade and markets. In the long run, this association will allow the rattan industry of Cambodia to export clean and high quality products into international markets while continuing to sustainably manage rattan resources in the Kingdom’s forests. Non-timber forest products (NTFPs) are all forest product other than timber. This includes not only fruits and vegetables, honey or resin, and non-timber construction materials like bamboo, rattan, and certain grasses, but also fish and other wildlife. Many people in and around protected areas in Cambodia depend on the collection of NTFPs for their livelihoods. When external influences decrease crop productivity, local communities resort to forest products as emergency sources to supplement their income. Resin is one of the most important NTFPs collected by rural communities in Cambodia. It is used as a raw material in the manufacturing of varnish, cheap soap, leather making, and sealing wax, as well as for caulking boats and in torches for lighting houses in the village. 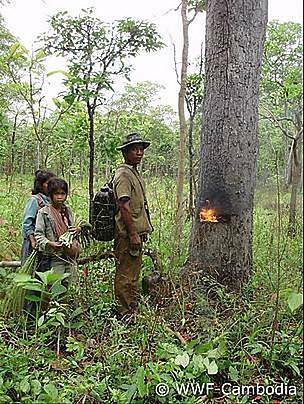 Resin is extracted from dipterocarp trees by making a small cut in the tree which is set alight to induce resin flow. 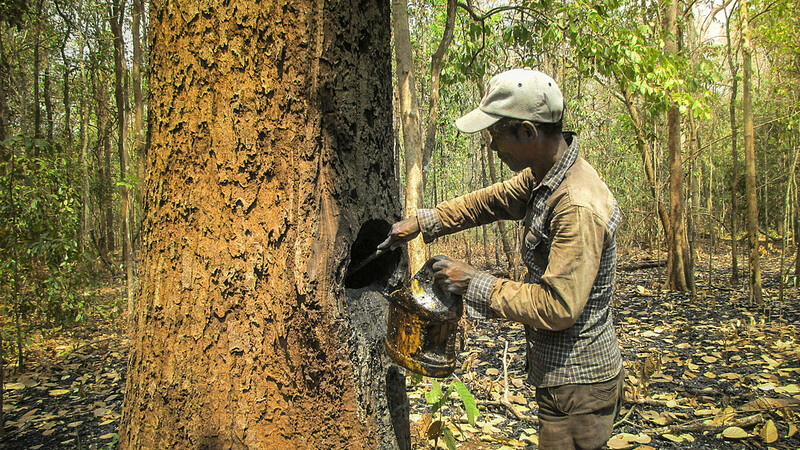 Around Mondulkiri Protected Forest, for example, resin tapping is an important economic activity for more than 40% of the people. There usually exists a traditional ownership system of resin trees where ownership is recognized and respected. Aside from liquid resin, solid resin is also collected, although at smaller scales. Solid resin does not have much commercial value at only 1500 Cambodian Riel per kg (ca. 0.13 USD) compared to liquid resin which fetches about twice that amount per litre. Resin tapping can be done sustainably but carries considerable collateral risks due to opportunistic hunting by collectors, diseases spread by domestic ox and dogs, as well as disturbance due to fire In response, WWF plans to phase out resin tapping in the core protection zones of its protected areas but will develop schemes to compensate tree owners.. WWF has also implemented educational campaigns spreading knowledge on sustainable practice of resin tapping. Honey collection has been an activity among forest communities for a long time because of its medicinal value. Honey hunting was traditionally mainly used for household consumption, but has now become a commercial activity due to the increasing demand for honey products in the province and the high prices of around 15,000-20,000 Cambodian Riel per litre (ca 3.75-5 USD). WWF seeks to promote sustainable honey collection to support local livelihoods. In cooperation with the Non-timber Forest Products Exchange Programme (NTFP-EP), WWF promotes and supports NTFP-based community processing activities. Communities are organised in groups, provided with capacity building, and receive help to publicly promote their achievements. To enlarge and secure contribution of forest honey collection to community livelihoods, honey collectors are trained in harvesting and processing techniques that are both sustainable and hygienic. Together with NTFP-EP, WWF has now expanded these activities to the formation of the Cambodian Wild Honey Network. This network will help strengthen the bargaining power of honey collector groups, let more honey collectors learn and understand about sustainable honey harvesting, and thus allow for more areas of forest to be protected. The Bunong indigenous group has been living in the forests of the Eastern Plains Landscape for many generations. 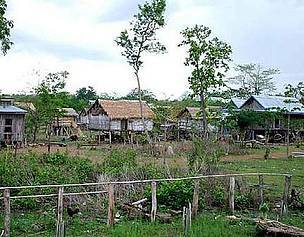 The majority of the Bunong people still uphold a subsistence and forest–based livelihood. However, over the past ten years the Bunong’s culture and livelihood have been threatened by forest conversions caused by the increase of migration and agribusiness operations in the province. To assist the Bunong communities in protecting their remaining forests, WWF selected two community forests - the Trapeang Khaerm CCF, located within Mondulkiri Protected Forest, and Khnheng CPA, located within Phnom Prich Wildlife Sanctuary, as the pilot areas to receive support. The TRAFO project was created upon the recognition that natural forests will not provide the same level of income that could be achieved with other land uses. The objectives of the TRAFO project are to identify appropriate financing incentives through an ‘Incentive to Conserve’ assessment, to establish and build capacity in the management of community forests, and to develop sustainable NTFP (non-timber forest products) use and management processes. One part of the TRAFO funding supports the 30 forest patrol team members whose dedication to protection takes them away from their normal activities. Another part will provide financial support to CCFMC and CPAC members to start up new enterprises, based on natural products, or to scale up their existing ones to allow them to move beyond a subsistence level and, hopefully, provide continued financial resources for the management of their community forests. Ecotourism offers one of the most sustainable means of making substantial economic returns from investing in wildlife conservation. The Royal Government of Cambodia, along with WWF and other NGOs, is testing tourism development as a way to conserve wildlife and contribute to economic development in the Eastern Plains Landscape.